By enable, I assume you mean "unmute", right? Also, what do you want to raise the volume to? 100%? 75%? Skrommel has written two scripts relating to this..
• MicMute - toggles the microphone's input volume between 0% and 100%. • PushToTalk - Press and hold Win+S to activate the microphone, release to disable. both can be found here at Skrommel Software.  MicMute - toggles the microphone's input volume between 0% and 100%.  PushToTalk - Press and hold Win+S to activate the microphone, release to disable. I haven't tested it, but if you are useing windows xp and have autohotkey installed, then you can use that, and when you run it, I belive it should unmute the microphone, and then set the volume to 85, and then it exits. Though I don't know what it would do in vista, since each program that you run has its own seperate volume control. no problem, PushToTalk can be modified to do what you want as nite_monkey has done. i don't have a microphone to test but i'd like to make a slight change to that script.. do give it a try and let us know. lol, thanks lanux, you made my garbage code look more profesional. you could test it by substituting the microphone part of the script with either wave or master volume. I can't test it right now though, because I'm at school, and my mic is at home. but still not what I was looking for. because the script is only effecting the playback control panel of the sound card and not the recording panel which I am interested in. like nite_monkey, i don't have a mic to test so you'll have to do the testing for us. anyway, i think it's because the recording panel is an extra component so maybe we need to add a ':2' after microphone. i posting the modified code, see if it helps..
actually i should thank you as your code simplified my work. I tested both versions of the code yesterday when I got home from school. The first version changed the playback mic, and like Learning, the second version didn't do anything. I guess AHK just hates the recording panel. 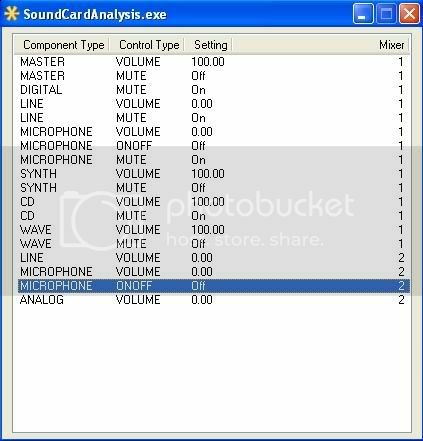 then we need to find out your sound hardware setup.. pls run this 'Sound Card Analysis' file and post the resulting window (see sample pic). btw, Sound Card Analysis script is available in AHK's help file but this exe was kindly compiled by [user]Target[/user]. from the screenshot it shows the mic as the 2nd component unless you have two microphones in the playback panel. anyway, try both of these scripts and post the message boxes' contents. also it might help to know what kind sound card do you have..
this script is not doing any thing to the recording panel, but when I change Microphone:2 to Microphone:1 it works perfectly on the playback panel exactly the way I want it. this means AHK is not able to connect to the 2nd component (recording panel) as returned by the SoundCard Analysis program. that's why ':2' wouldn't work while ':1' works fine. either that or i'm missing something. anyway, i'm afraid that we have to put this into KIV for the time being. just to compare notes, i happen to have the same soundcard but i don't have a built-in microphone. as can be seen from the pic, i have the mute option. maybe i'll see if i can borrow a mic and do some further testing.